When it comes to wet or canned dog food products, Cesar dog food is almost always in the minds of pet parents. They are especially known for creating a dizzying array of canned and wet dog food formulations in different flavors. However, a number of Cesar dog food reviews have consistently ranked the brand rather poorly, faring even worse than some conventional dry dog food. This largely contrasts with individual reviews by pet parents who seem to love the brand better than others. In this review, we will attempt to dig a lot deeper into the brand’s ingredients since these are basically the bottom line of any pet nutrition. We’ll first look at five of the brand’s bestsellers then look at the strengths and weaknesses of the dog food as a brand. Nothing beats the classics. 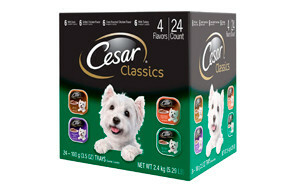 And when it comes to Cesar Classics dog food this variety pack is the deal to beat. Imagine giving your pet a delectable choice of the yummiest treats that can be fed as is or as topper to their favorite dry dog food. Each pack comes in 4 different flavors including duck, grilled chicken, turkey, and oven-roasted chicken. It’s a dizzying array of poultry goodness in a way that only Cesar can prepare. Each formulation comes with the right blend of animal proteins that are also fortified with minerals and vitamins to get your hound up and running. It’s one of those wet dog food foods that pet parents have come to love since their hounds obviously love the taste. 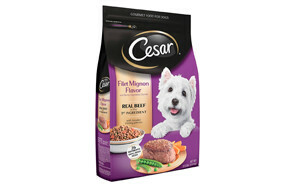 This Cesar wet dog food is a must if you’re shifting your pet from the dry world of kibbles. Ah, the sight of whole chicken being grilled turning around in a rotisserie. It sure is going to be a feast for your pet once you give it this Cesar Savory Delights creation that comes not only with rotisserie chicken flavor, but also infused with all the delicious goodness of smoky bacon and rich, luscious cheese. This Cesar dog food is formulated to provide your dog with well-balanced and complete nutrition in a very saucy recipe that is guaranteed to make your dog salivate even more. The minerals and vitamins added into the formulation further help enhance its nutrient profile making this formula a true delight for 4-legged friends. Get your pet ready for a really festive plate as it surely will gobble up an entire tray or two of these chicken delights. It’s the kind of meal you want to give to a pet that’s quite choosy when it comes to its food. Every fine restaurant has its own version of a signature porterhouse or a fillet mignon with that classic sear on the outside and the tender, juicy goodness on the inside. The Cesar Classics dog food Pate Beef Multipack dog food trays may not give your hound a Michelin Starred steak, but it sure can get them romping off to a fiery and beefy start. It’s a meatlover’s feast, a carnivore’s delight, and a dog’s ultimate dinner. Of course, what good is a dog food that comes with really tasty ingredients without a healthy heaping of vitamins and minerals to get every organ system functioning at their optimum levels? This is pet food at its finest that it could very well pass as a venerable Cesar puppy food or a diet for seniors. Its rich, velvety smooth texture should make it extra-easy to gulp as is or as a bonus topper for your dog’s kibbles. Designed specifically for your little one as well as smaller breeds of dogs, this Cesar dog food is one of the brand’s unique take on what a dog kibble should be. Featuring the delicious flavor of fillet mignon and garnished with the freshest veggies you can find, it’s like giving your dog a real plate of finely-grilled steak with steamed veggies on the side. A highly notable feature of this Cesar dog food is that its kibbles are not the usual rounded or square shaped. Instead, they take on an unusual H-shape to allow for a more efficient removal of your pet’s tartar and plaque. It’s a great way to start caring for your puppy’s teeth while making sure that it gets the best nutrition for it to grow healthy and strong. Who doesn’t love a porterhouse especially when added with potatoes on the side plus a hint of smoky bacon to follow the delectable cheese? 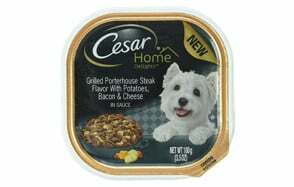 Well, that’s exactly what you’re giving to your pet should you decide to give it the Home Delights Cesar Wet Dog Food in grilled porterhouse steak flavor. The richness of juicy beef lathered with the goodness of a thick sauce is guaranteed to get your hound all pumped up for its next dinner. Each tray is enriched with all the minerals and vitamins that you pet needs for optimum health. The Cesar dog food ingredients put into the Delights are carefully selected to bring to your pet the right blend of complete and well-balanced nutrients for optimum growth and development. And with a flavor that is so irresistible, the Grilled Porterhouse is surely a great hit every time, all the time. According to the company’s website, Cesar is a brand of pet food whose sole mission is to provide pets with the kind of food that they will love, ensuring only the nutrition and the quality that they deserve. The brand is under the management of Mars Petcare, the same umbrella organization that handles Eukanuba, IAMS, and Pedigree dog food brands, among others. Mars is a global conglomerate that ranks number 6 on Forbes’ largest companies in the US. Like other pet food brands, Cesar has been subject to pet food recalls, the most recent of which was in October of 2016. The brand recalled its Classic Fillet Mignon flavor because of the risk of choking emanating from the inclusion of small plastic pieces in the manufacturing process. One of the best reasons why you would want to give your pet a Cesar dog food is the taste. We’ve read a good number of Cesar dog food reviews and if there’s one thing that pet parents love about the brand, it’s definitely its palatability. This makes it exceptionally great for dogs that may not be eating properly since their sense of taste may be altered by a disease process, the aging process, or maybe as a result of medication. It is because of its extreme palatability that one can think of the Cesar dog food as essentially giving your pet the kind of food that you’re having on your plate. Because of this, it’s the perfect topper for your dog’s kibbles. And if you don’t mind paying a hefty price, it could very well be a standalone meal in itself. That being said, another reason you might want to get a Cesar dog food is for weight control. Since each tray will typically come with a set number of calories, you can easily determine the exact amount of dog food to give to your pet. There’s no doubt that Cesar wet dog food products are a sure hit especially among pet parents who dislike the idea of giving their pets dry, crumbly, awful-tasting kibbles. Because the unique formulation of Cesar dog food products makes it a very yummy treat, dogs are known to devour entire trays within seconds. But does this palatability easily translate to optimum nutrition for your pet? A closer analysis of Cesar dog food ingredients reveals the following. On the average, Cesar wet dog food contains about 8 percent proteins which is roughly translated to 44.44% when only its dry matter is considered. Its dry dog food formulation comes in at 26% which can be recomputed for its dry matter weight as roughly 29.5%. When compared to other dog food brands of either wet or dry varieties, the protein content of Cesar dog food can be considered to be on the average, or below average to be more precise. We’ve seen canned dog foods with dry matter protein proportions reaching up to 50-55 percent while dry dog foods typically have 35 to 40 percent. While this is commendable, we would like to point out some misses in the formulation of Cesar dog food. It is good that its principal protein is from an animal source. Unfortunately there are several instances when the protein is not named. For example, we’ve seen “meat byproducts”, “meat and bone meal”, “animal liver”, and “animal plasma” in the list of Cesar dog food ingredients. This goes contradictory to what we have been espousing – that the proteins be named. Putting “meat” in the label doesn’t give you a clear idea of what animal the meat or bone came from. Putting “animal” on the label also makes it very vague as the animal kingdom is a large taxonomic classification. While the brand does manage to name certain animal proteins like chicken, beef, turkey, and the like, it boggles the mind as to why some ingredients are not clearly identified. Another issue we would like to raise is the use of byproducts. Advocates of raw dog food know the importance of using every edible part of prey animal for food. This is where the logic behind the use of byproducts are. And we don’t have anything against it. However, what we find a little bit troubling is that a pate that is supposed to be “turkey in meaty juices” actually has water, beef byproducts, liver, and meat byproducts as its top 4 ingredients. Turkey, which is supposed to be the star of the meal, is a distant 5th. The same is true with their Rotisserie Chicken. Chicken itself is number 4 on the ingredient list topped by water and beef byproducts. Again we don’t have anything against byproducts, but when it comes to high quality proteins byproducts clearly isn’t the way to go. The average fat content of Cesar dog food is at 3.125% for its wet version, translated into 17.36% as dry matter. Its dry dog food version comes in at 13%, recomputed into 14.7% as dry matter. This is substantially lower than most other dog food products we’ve seen. However, our only lament is that there seems to be no indication of just how much omega-3 and omega-6 fatty acids are contained in the ingredient list. Analysis of both protein and fat content of Cesar dog food products give it a carbohydrate content of 38.2% as dry matter. This is substantially lower than most pet foods we’ve seen. Sadly there are a few points that need to be addressed. The formulation of Cesar wet dog food comes with allergenic grains like wheat gluten, soy, and corn gluten meal. In some products we have also seen “starch” without any clear indication as to just what kind of starch there is. We also read xanthan gum in the Cesar dog food ingredient list which is a very common food additive, stabilizer, and thickening agent. We leave it up to you to decide whether these are healthy or not. Because of the choice of low-quality, unnamed ingredients, Cesar dog food find it necessary to supplement its nutrient profile with vitamins and minerals and not necessarily those coming from the ingredients themselves. We have never found any mention of glucosamine or chondroitin in the formulas. There was no mention of omega-3 and omega-6 fatty acids as well. Honestly, we’re baffled as to how the brand can do very well in the market when it is fairly obvious that it doesn’t contain the right types and amounts of nutrients that dogs need. We also found some troubling artificial ingredients in Cesar dog food products. These include the artificial colorings Yellow #5 and #6, Red #3 and #40, and Blue #2. We also found sodium nitrite which is a color preservative and sodium tripolyphosphate which is also a preservative. Cesar dog food has one of the widest assortments of wet and canned dog food in the market. It formulates dog foods in a manner that is really tasty and delicious that they are more inclined to gobble up an entire bowl filled with Cesar than a container filled with dry dog food. Unfortunately, while its protein content is admirable, there are many questions as to the quality of the proteins put into its formulations. There are allergenic grains and artificial colorings, too. It pains us, but we’d have to agree with a number of Cesar dog food reviews – this is not really a dog food that you’d want your pet to have. However, if you’re after the delicious taste that your dog will really love, then Cesar wet dog food is always a good choice.